With an uplifting and bold tagline emblazoned on their tee shirts, three guys from FirstBank flexed their muscles and fired their brain cells to show that “Banking for Good” is more than a company slogan, it is a company culture that encouraged them to volunteer with the Developmental Disabilities Resource Center, and help those with intellectual and developmental disabilities (IDD). 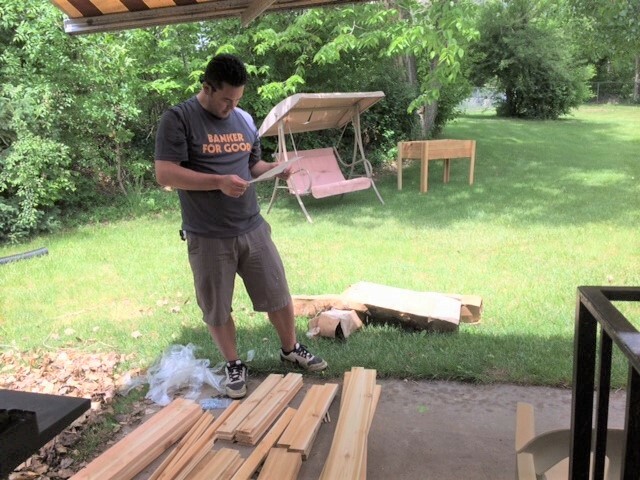 Undaunted by the summer heat, Harold Dickerson, Cody Widiger, and Ron Lindsey, who are part of FirstBank’s Fraud Analytics Operations, tackled multiple clean-up projects on two Lakewood, Colorado properties that are group homes for those who are differently-abled, those with IDD. The men removed stubborn overgrown bushes, hauled dead and fallen tree limbs, raked up debris, cleaned out window wells, and made multiple trips to dumpsters – all of which resulted in tired yards taking on an inviting feeling. It was a wonderful improvement to the properties, where the residents didn’t have the tools, pickup truck, or physical ability to accomplish the heavy lift of that effort. Taking the better part of an afternoon, the volunteers also tackled construction of many raised garden planter kits, providing the residents an opportunity to grow flowers, herbs and vegetables. The nonprofit Developmental Disabilities Resource Center manages the group homes, where about six to eight individuals live in each house. DDRC manages about eleven such homes, and also coordinates with apartment managers and individual homeowners to provide additional housing. A mere 50 years ago, people with IDD were shuttered away in large, impersonal institutions, so the approaches taken today allow people with IDD to live more authentic lives that are connected to the community. When asked by DDRC why they volunteered, Harold, Manager of Fraud Analytics said, “FirstBank encourages employees to give back to the community; it’s an important part of our culture. We're here to help people in need.” Ron shared that he has a friend who works with children with autism, so he knew about intellectual disabilities, and was eager to make a difference in his own way. Cody expressed appreciation of FirstBank’s support of time off from work for employee volunteerism. See more about FirstBank in their community report and video. If your company would like to see how they can make a difference by supporting the services of DDRC, contact DDRC’s Volunteer Coordinator at 303.462.6585 or email April.Richey@ddrcco.com, or contact our Community Relations Office at 303.462.6623. Karen Allison, DDRC Quality Living Options Program Manager, stands with FirstBank volunteers Ron Lindsey (L), Harold Dickerson (C), and Cody Widiger (R).